Oil separator minimizes the amount of oil circulating in the cooling system. Oil to coat the inside of each cycle of the cooling components, through which it passes. This reduces the heat transfer efficiency and capacity of the evaporator and condenser. This is one of the reasons for separation as much oil as possible with the refrigerant before sending it to the system. Another reason is to slow down the accumulation of oil in those places where it is difficult to return the oil. This consideration is particularly important where the refrigerant is not mixed. The refrigerant does not dissolve in oil and oil is not soluble in refrigerant. Oil separators are recommended for all systems using non-miscible refrigerants. Ammonia is not mixed, and R-11, R-12, R-113, R-114, R-500 and mixed. R-22 and R-500 are limited compatibility, but mixed with oil for normal comfort air conditioning temperatures. Oil separators is also recommended for low-temperature applications, and those that use the flooded evaporators. Examples of centrifugal chillers liquid and flooded a cooling coil. Finally, oil separators are used at any split-system or system with suction or discharge struts and/or capacity reduction steps. These functions are often the cause of problems with oil return. In practical terms, this means that oil separators are usually not found on residential and commercial comfort air conditioning systems. They are increasingly used in refrigeration and industrial applications. Centrifugal chillers are more likely to oil, reclamation systems, than the oil separator. The only goal of the oil in the refrigeration cycle compressor lubrication. 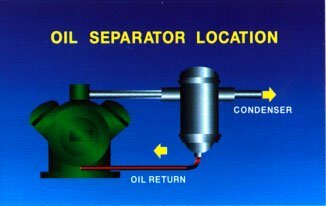 Thus, oil separator installed in such a way that oil will be chained to the compressor. As shown here, it is usually installed in the discharge (hot gas line as close as possible to the compressor with the practical point of view. It is set after the silencer, if the silencer. Oil return line is connected directly to the compressor crankcase in some designs. In others, it is forwarded to the compressor suction pipe. Although oil separators, when used correctly, are very effective in the removal of oils with the refrigerant, they are not able to delete the circulation of oil with gas discharge. Some oils still finds its way into the system. Therefore, when oil separators are used, some means must be provided periodically return the accumulated oil in the compressor. Oil flows are provided for this purpose at the bottom of the receivers, condensers, evaporators, batteries, and other vessels used for ammonia systems. Automated methods are used. Compressor oil comes in contact with the refrigerant in the compressor. As a result, a certain amount of oil will be carried out along with the compressed refrigerant leaves the compressor through the discharge line. 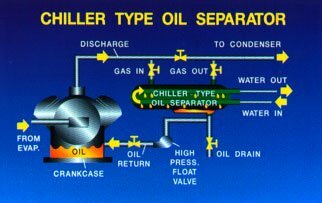 Two main types of oil separators are attempts against type as shown below, and chiller type. In an attempt type, oil discharge gas goes through several screens or walls. Since the area in the separator is more, than in the discharge line of hot gas flow slows down. This allows the oil to adhere to, or infringe on the screens. He leaves on screens in the sump at the bottom of the tank. Float valve in Carter supports liquid seal between high and low pressure sides of the cycle. This valve automatic oil return to the compressor through the hole. Hmm type of oil separator can be water-cooled, as shown below, or the refrigerant is cooled. "Oil cooler", as it is sometimes called, is similar design with a water-cooled condenser. The water flows through the tubes, and the oil-Laden gas discharge passes through the shell. Oil delays on the cold water pipes and falls down into the sump. From there, it automatically returns to the compressor through the float valve. The flow of water through the separator should be regulated so that the vapour refrigerant is condensed into a liquid on the surface of the tubes. If so, the liquid refrigerant will be sent back to the compressor inlet, causing slugging, foaming of the oil and oil dilution. 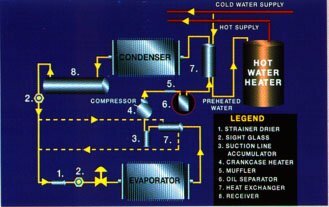 These conditions can damage the compressor and Rob the system efficiency.